Magnuson Hotels, the world’s largest independent hotel group, announced today the complete rebranding of the Magnuson Grand Hotel and Conference Center Hammond. Formerly franchised by Choice Hotels as the Quality Inn and Conference Center in Hammond, Louisiana, the hotel will upgrade its local, regional, and national market to attract business, group, and leisure travelers via an affiliation with Magnuson Hotels’ global portfolio of nearly 2,000 hotels. Corporate, educational, government, and leisure travelers will appreciate the Magnuson Grand conveniently located near Interstate 12, Interstate 55, and U.S. Highway 5. Guests will appreciate nearby Kliebert’s Turtle and Alligator Tours excursion featuring a bird sanctuary, animal preserve, and thousands of alligators. The town of Ponchatoula, known as America’s Antique City, is just 5 miles from the hotel. Guests will enjoy a free deluxe breakfast, crystal clear indoor and outdoor pools, hot tub, exercise room, full service business center, free high speed internet access, and free parking. 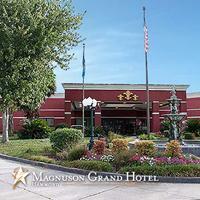 The Magnuson Grand Hammond boasts 9 meeting rooms with over 9,300 square feet to accommodate groups up to 300. Catering services are available. Guest room amenities include free wireless internet access, hair dryer, free local calls, coffee maker, cable TV with extra stations, air conditioning, alarm clock radio, and electronic door locks. “We are proud to welcome Fred Kirsch and his entire staff, and are fully committed to increasing their property visibility and reservations,” stated Thomas Magnuson, CEO of Magnuson Worldwide. As a Magnuson Hotels affiliate, the Magnuson Grand Hotel and Conference Center Hammond is a member of the Magnuson Hotels Premier Collection, an elite portfolio of the highest quality hotels and locations represented by Magnuson Worldwide. The Magnuson Grand Hotel and Conference Center Hammond will receive complete global brand representation without the costs and requirements of franchise brand affiliation. It will expand its business through Magnuson Hotels’ massive hotel reservation network including 650,000 GDS travel agents, all global corporate accounts, over 2,000 internet booking channels such as Global Hotel Exchange, Expedia, Hotels.com, Priceline, and all major airlines websites.